The Readings Foundation has announced $184,692 worth of grants to support a range of projects and organisations within Victoria in 2018. The Readings Foundation assists Victorian organisations that support the development of literacy, community integration and the arts. Readings donates 10% of its overall profit to the Foundation each year, and the kind donations from Readings’ customers make a crucial contribution. In 2018, grant funding has a strong focus on organisations that are delivering literacy and education support to the most disadvantaged people in our community. Ardoch Youth Foundation will run four Writer in Residence programs within their partner schools in Inner Melbourne, Melbourne’s West, Frankston and Dandenong. Ardoch partners exclusively with schools which have been identified by the State and Federal Government as facing disadvantage. Published writers will deliver workshops to Years 3, 4 and 5 students over seven weeks. The children will benefit through greater creative engagement in learning and literacy, building their confidence and writing skills and inspiring them to create stories together. The opportunity to work closely with a published author and positive adult role model will also build their aspirations and self-esteem. Each child will receive a copy of their published book to keep. 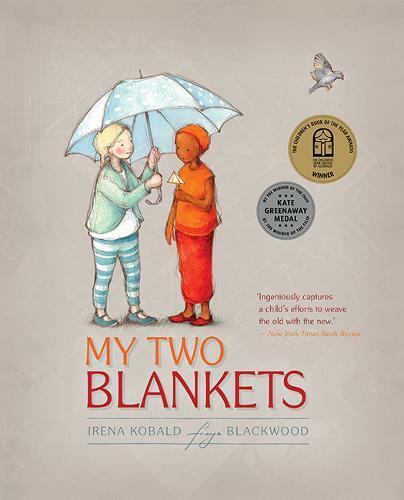 Asylum Seeker Resource Centre will create three bilingual versions of the Australian children’s book, My Two Blankets, written by Irena Kobald, illustrated by Freya Blackwood and published by Hardie Grant Egmont. Translations will be created by ASRC members working with a professional translator. ASRC members will receive a beautiful work of literature to share with their families, and parents will be supported to read with their children, drawing on both English and their home language. The broader aim is to seed an ongoing project to produce bilingual children’s books that are accessible and affirming to families seeking asylum. The Banksia Gardens Aiming High VCE Support Program helps committed students from disadvantaged backgrounds overcome barriers to achieve their best in VCE. Staff, volunteer and paid tutors conduct weekly study group sessions at two locations in Broadmeadows and Craigieburn to support student learning across the curriculum. In addition to subject area and general homework help, the program features specialist workshops, academic and study skills training, industry-based guest speakers and excursions to keep students engaged and motivated with their studies. The Brotherhood of St Laurence will provide three books for each of the 130 children and families who participate in the Fitzroy and North Melbourne Home Interaction Program for Parents and Youngsters (HIPPY). The families involved in the programs are disadvantaged and include migrants, refugees and asylum seekers. Newly arrived families will be encouraged and assisted to learn English by the provision of bilingual books. The Carlton Neighbourhood Learning Centre adult literacy tutoring program has been running since 1985. Trained volunteers work one-to-one with adult students on a weekly basis, either at the centre or at a local library. The adult learners are from a range of backgrounds, all of whom are at a disadvantage when it comes to representation in the workforce and higher education: refugees and migrants, native speakers with disrupted or minimal education, adults with disabilities and adults in the low skilled workforce who are facing an insecure future. Due to the growing demand for tutors and changing and increasingly complex literacy demands, CNLC will expand and improve their training program to best support their students. The Carlton Family Learning Program run by Church of All Nations provides a safe and supportive out-of-school learning environment for primary and secondary students. The Program operates with volunteer tutors at the Kathleen Syme Community Centre and Library, and works in partnership with families who contribute to the program and are encouraged to attend and be part of the learning activities for the younger children. The majority of families and students involved come from the Horn of Africa and have limited access to literacy, computers and educational support. Jesuit Social Services has run the Flemington Homework Club since 2004, providing a safe, welcoming and supportive learning environment for young school students of migrant and refugee families under the guidance of volunteer tutors. Outcomes for the participating students include greater engagement and performance in school, higher self-esteem, better mental health and a sense of belonging and positive identity in the community. The Homework Club also facilitates a sense of belonging for the students’ families by providing an opportunity for regular social engagement. Kids Under Cover provides support to students and families who are struggling to meet the basic costs of schooling. KUC will provide scholarships to young Victorians who were at risk of youth homelessness and now reside in a KUC studio. Many are striving to overcome disadvantage, poverty and past trauma, and all will be enrolled in, or about to enrol in, school or accredited training. This support can be a vital intervention in the cycle of poverty and disadvantage. Meadow Heights Education Centre runs English language, literacy and numeracy classes for adult migrants and refugees and provides them with free childcare whilst they are in class. The children of migrants and refugees benefit from daily stories, phonics, language practice and one-on-one attention, giving them the best chance at reaching their developmental milestones. The Bridging the Gap program will give childcare educators the books, tools and culturally appropriate equipment they need to properly address the children’s language, developmental and social delays and ensure their transition readiness for school and preschool. Reading Out of Poverty has developed an educative book and mentoring service to boost early literacy skills of Melbourne’s newborn children from migrant and refugee backgrounds. The project seeks to provide educational support services and resources for mothers with low literacy in the City of Springvale, to assist their children in developing strong reading habits from ages 0 to 6 years and to empower the mothers to be their child’s first teacher. ROOP strives to ensure that children from low income homes are better prepared for school and can avoid generational poverty and illiteracy. Let’s Read is an early years literacy program that promotes reading to children aged 0-5 years living in disadvantaged communities. Let’s Read develops the ability of early years educators, parents and carers to share words, stories and books with young children, providing the tools for families and communities to establish the building blocks for literacy and a love of books. Children learn more when something is shown to them as well as explained, so Let’s Read provides parents and carers clear and simple information through a ‘share and show’ technique. The project will support 750 children and their families, who are living in the City of Yarra’s high-rise public housing estates in Collingwood, Fitzroy and Richmond, along with their broader communities. Girls Write Up is a full-day festival for teens that teaches empowerment through writing and sharing stories. The festival is for young people aged 12–18; it is feminist and inclusive, and young people of all genders, sexualities, and cultural and racial backgrounds are encouraged to attend. The unique, innovative program of talks, interactive panels and practical workshops explores the relationships between language, gender and power. Girls Write Up elevates voices and stories that have been historically devalued or marginalised, and gives all participants the opportunity to discover their own creative voice, equipping them with the skills and the confidence to use it. In 2018, the Stella Prize will continue to offer their outreach program – 30% of tickets to their two full-day 2018 Girls Write Up Melbourne events will be available free to students from minority and/or disadvantaged backgrounds. The Deadly Sista Girlz program is a mentoring program utilising positive female Aboriginal and Torres Strait Islander role models to encourage Aboriginal female students to attend school, better their education outcomes and prepare students for further training and/or entry to the workforce.This project is targeted at disadvantaged and at-risk Aboriginal girls aged between 12 and 18 years who attend an inner-city Melbourne high school. Program mentors will facilitate yarning circles focused on addressing participant educational, health and social issues. The Readings Foundation will continue to support The Wheeler Centre’s Hot Desk Fellowships for the seventh year in a row. This program creates opportunities for 20 talented writers by enabling them to pursue their writing at a dedicated desk at the Wheeler Centre for 10 weeks, supported by a $1,000 stipend for each writer. Over the years, many Hot Desk alumni have published works that have ended up on the Readings shelves. The Readings Foundation will also support the Brotherhood of St Laurence’s Hope Prize in its second year, with the provision of two Women’s Writing Career Development Scholarships worth $5,000 each. The Hope Prize encourages writers to explore people’s resilience in the face of poverty and disadvantage, and to look beyond all too common stereotypes to depict the strengths that people and communities show in dealing with hardship.